For many families, Thanksgiving dinner just wouldn't be complete without mashed sweet potatoes topped with miniature marshmallows and chopped pecans. But you need not relegate this hardy, healthy tuber to a once-a-year treat. In addition to casseroles galore, you can find recipes for preparing baked, boiled, roasted, mashed, and fried sweet potatoes. There are also sweet potato desserts and sweet potato soups. For the most part, you can interchange sweet potatoes, particularly the pale variety, in recipes calling for white potatoes. Prime harvest season lasts from October to January but you can usually find fresh ones in stores throughout the year. Grocery stores carry canned sweet potatoes year-round, which may confusingly be labeled yams. Select sweet potatoes with tight, unwrinkled skins that show no signs of blemishes or bruises. Look for small- to medium-sized ones as the larger they get, the starchier they become. Sweet potatoes range from cream-colored varieties to the deep orange ones sometimes mistakenly referred to as yams. There are even purple ones. The flesh of the dark orange sweet potatoes tends to be sweeter and creamier than that of the pale yellow ones or the purple ones, which resemble the drier, starchier flesh of a russet potato, albeit with a nutty flavor. Somewhat less hardy than their white cousins, sweet potatoes generally do not store well, except under ideal conditions, and bruised ones rapidly deteriorate. Unfortunately, once sweet potatoes begin to go bad, you cannot just cut away the spoiled part since the decay affects the flavor of the entire potato. Stored at average room temperature (68 to 70 F), sweet potatoes last for about a week. For longer preservation, you need a cool (55 F), dry, dark location with adequate ventilation. In these conditions, sweet potatoes last up to four weeks. 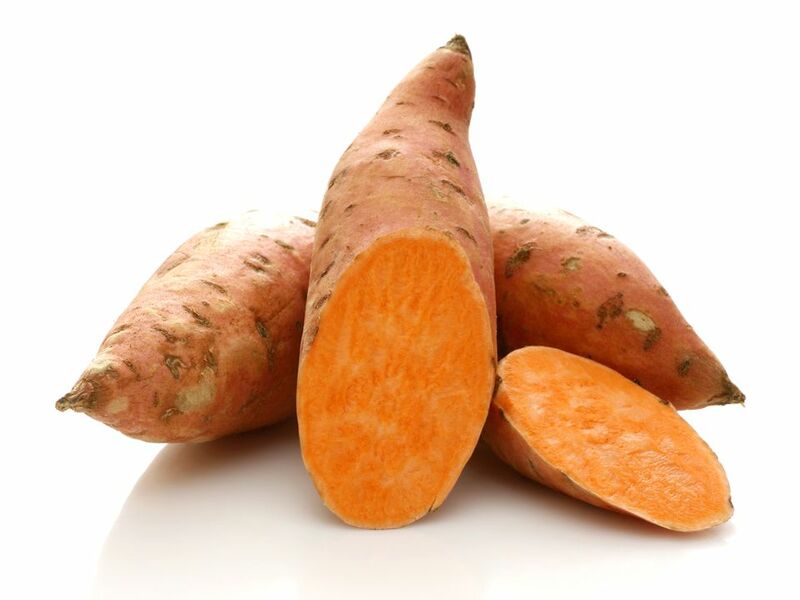 Do not refrigerate raw sweet potatoes, which can lead to a hard, unpalatable center and be off-flavor throughout. Cooked sweet potatoes last in the refrigerator in an airtight container for four to five days. To reheat baked sweet potatoes, cut them in half and place them cut-side-up on a microwave-safe plate. Cover the potatoes with a damp paper towel and microwave them on medium for about two minutes, or until they're warmed through. Use a 350 F oven to reheat sweet potato casseroles, mashed sweet potatoes, and roasted sweet potatoes. Cover the dish with aluminum foil and bake until warmed through. To freeze cooked sweet potato casseroles, pack them in an airtight container, leaving 1/2-inch headroom, then press a piece of freezer paper or plastic wrap directly onto the surface. Keep them in the freezer for 10 to 12 months at 32 F. You can freeze whole baked sweet potatoes by individually wrapping them in foil, then storing them together in a zip-top freezer bag. For best results, thaw frozen potatoes overnight in the refrigerator before you reheat them. Sliced, mashed or cut sweet potatoes can discolor in storage, so sprinkle the surface with some lemon juice or ascorbic acid to prevent this.